With a maximum gain of 16dB, it doesn't get much stronger than this. 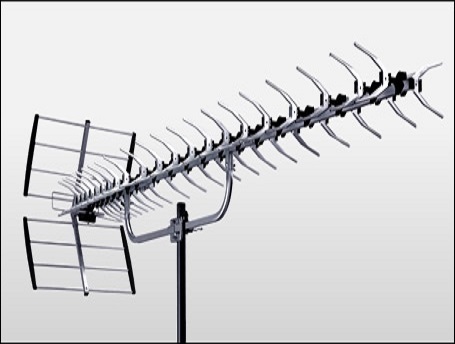 If you have weak channels, a high gain antenna like this is your best bet. The Yagi design is known for it's long distance reception. The HDB91X can pick up stations as far as 70 miles away. High mileage antennas are your best chance at getting weak signals. If there’s one quality you want in a long range HD Antenna, it’s directional! Small, plastic, 360° antennas don’t cut it when it comes to locking in long distance HD channels. The best choice for distant signals … the HDB91X’s unique design will pick up signals that other antennas can’t! If you are trying to pull in long distance stations, or simply want the strongest antenna you can buy, you will appreciate the sheer power of the Xtreme Signal HDB91X. This super deep fringe antenna is designed to focus in on those distant signals like no other. It’s the hobbyist’s choice for clean, clear signals no matter what the distance. The HDB91X from Xtreme Signal is your choice because its durable construction offers you years of viewing with no maintenance. Unlike other deep fringe antennas, its built-in transformer needs no “balun” to work with today’s 75-ohm antenna cable. Other companies use inexpensive baluns and weather shields that won’t work over the long run. Why worry about replacing a part like that when you don’t have to? 90% of TV watching is from the four major broadcast networks, and nothing can compete with the clarity of an over-the-air signal. Cable and satellite companies re-process their signals, robbing them of their original quality in order to fit more channels in the same space. There’s only one place to get a pristine broadcast signal – your antenna. Unlike indoor antennas, a deep fringe antenna is designed to be pointed in one direction and left there. The strong adjustable-angle mount of the HDB91X makes it easy to aim your antenna perfectly the first time and leave it in position permanently. Choose an antenna whose power and reliability make it the choice now and for the future… the HDB91X.